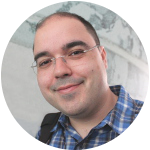 Miguel L. Pardal is a researcher at INESC-ID in the Distributed Systems Group (GSD) and an Assistant Professor at Instituto Superior Técnico, Universidade de Lisboa, Portugal. (see personal website) He is currently participating in the Safe Cloud EU Project (H2020) in partnership with TUM and others. During his PhD, he was a visiting student at the Auto-ID Labs at MIT. He currently has more than 30 publications and his main research interests are: Distributed Systems, Cybersecurity, Internet of Things, Cloud Computing, and Enterprise Systems.